When you see a review with the words Short Ashes tacked onto it, it implies that the review is a revisit of a cigar we’ve looked at in the past, or that it is a quick review in general. This time around, the review is a result of “I’m bored… oooh, look a camera!” I was deep into an Oliva Serie V Melanio at the time but just felt like talking. The video runs roughly 6 minutes and is basically a down and dirty review with some random thoughts thrown in. If you are looking for an in-depth review of this cigar, I would suggest checking out Ben’s review of the Oliva Serie V Melanio Torpedo. Love love love this stick. Can’t wait to pick up a box. Wow, nice to see you putting the hours in again! Two in a week! I haven’t tried this one but would certainly like to. 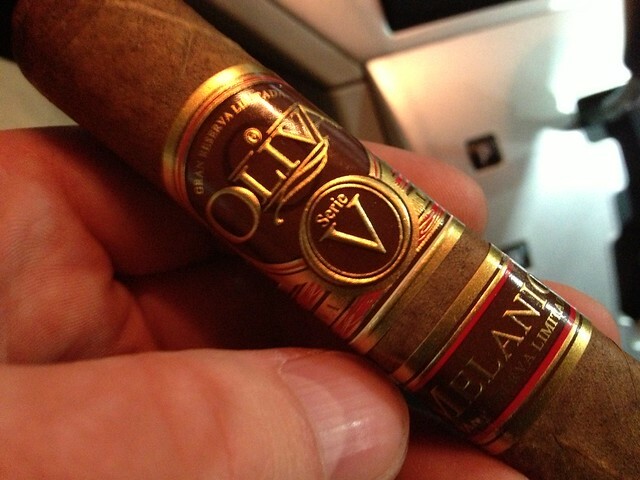 When I think Oliva, I think resonably priced cigars that are consistent, enjoyable, and widely available. I say let Oliva have its super premium (with price to match) so long as lesser Oliva blends continue to offer the same bang for the buck. I haven’t had one of these yet. Not sure if I will or not. I’m with you on price, Walt. I am SO over the over-priced LE thing. These couldn’t have cost THAT much more than the regular V to produce, certianly not enough to justify selling these for double the price! When people make their cigars limited just to be able to charge more, I think that’s crap. I prefer the way Tatuaje, Illusione, Room 101 (et al) do it … an LE can be $6, or $15, but it depends on the components, size, etc. Of course it costs more to produce a small batch than a full line (stick for stick), but let’s try to keep things reasonable, shall we? I know that you should judge a cigar for what it is vs. price, but stuff like this makes it hard for me not to be overly critical of the stick. I get tired of people complaining about size/price trends in general. Don’t like the expensive ‘limited’ sticks? Don’t buy them. Get tired of the 60rg trend? Smoke the smaller cigars that are also readily available. Something for everyone, no need to bash something just because YOU don’t like it. Was at a conference in SDiego and ran into Captain Hunts smoke shop. Probably the one of the best places to enjoy a cigar with a view the ocean. Grabbed a Oliva V Milanio short mostly due to reputation and I usually buy cigars that I never tried. The price was steep $14.50. The taste blew me away. Tasty smooth and delicious. Immediate top 10. They had the figurado for $22.50! Like you said special occasion smoke. Definately a must try for aficionados. I love this cigar. I feel like it’s absolutely worth the price of admission. And laying down a blanket statement like “it couldn’t cost THAT much more than the regular V” is kind of ignorant. The amount of tobacco sourced for this particular blend and the presumed longer period of aging/curing and quality rollers needed for the vitolas most certainly does increase the cost significantly. The longer they sit on product before it’s ready to ship retail = expense. If you don’t like it as much or better than the regular production V then don’t buy it. I don’t find these overly pricey at all for the quality. While I support my local 100%, a box of shorts online cost as little as $55 plus shipping. I would smoke very little at those CA prices, no doubt.